Aspen Creek # 204 bénéficie d'un emplacement privilégié à proximité de toutes les activités de Mammoth. Eagle Lodge et le télésiège Eagle Express sont accessibles à pied et sont parfaits pour les vacanciers en hiver qui cherchent à dévaler les pentes. Les saisons plus chaudes vous invitent au terrain de golf de Snowcreek, à la pêche, à la randonnée et au vélo - tous rapidement accessibles en voiture. Cette maison de vacances dispose d'une salle de boue pleine taille lors de l'entrée dans l'unité. Accrochez vos manteaux et déposez votre équipement de neige. De l'autre côté du couloir se trouve une cuisine entièrement équipée. Il a tous les appareils dont vous pourriez avoir besoin pour préparer de délicieux repas. Prenez l’un des huit sièges de la table à manger pour un repas en famille. Le salon a une magnifique cheminée en pierre avec du bois de chauffage fourni. Rassemblez-vous autour de la télévision et insérez un film dans le lecteur de DVD. Internet haut débit est également offert pour votre plus grand plaisir. Passez les portes du balcon privé. Vous trouverez ici de superbes vues sur les montagnes. Au bout du couloir se trouve la chambre principale. Cette chambre est dotée d'un luxueux lit king-size et d'une salle de bains attenante. Il y a une zone de vanité et salle de bain complète. La deuxième chambre peut accueillir 2 lits jumeaux et une salle de bain complète attenante. En haut, vous trouverez la dernière chambre. Cette pièce est idéale pour loger les enfants. Il a un lit superposé et un lit simple. L'espace commun dans le loft est équipé d'un canapé qui fonctionne comme un canapé-lit. Une salle de bain ici a un bain à remous pour se détendre. Un parking souterrain est disponible pour 2 voitures (hauteur du garage 7'1 "). Aspen Creek offre de nombreux équipements à vérifier. Buanderie et ascenseurs dans chaque bâtiment. Il y a des barbecues, des aires de pique-nique et une piscine ouverte uniquement en été. Les 3 bains à remous sont ouverts toute l'année. The description states "spacious" but is not. Furniture is crowded into living room and there are 2 huge bean-bag 'chairs' that simply get in the way. No way in God's green earth could we have fit 8 people in common area unless we were all very chill and okay with being on top of each other! There is a little loft but who wants to sit up there when the TV is downstairs. Kitchen is a 1.5 person space and has quite limited pans (ok pots) for cooking so you need to be inventive sometimes. Utensils adequate and there were 2 (!?) electric hand mixers and I think a crock pot. Microwave works. Coffee pot dribbles all over, so pour over the sink. Fridge / freezer has some broken door holders. Ice maker does not work but there were (empty) ice cube trays. Many lights very dim - bulb out in mud room. Living space dim - has obscure lighting from loft. Room with queen bed dark - took 2 nights to find a small switch by headboard. I am 5'9" and the downstairs shower head came to my eyebrows. My 2 sons are 6'2" and we had a 6'7" friend...all had quite a laugh doing yoga after a long day skiing trying to shower. Shower downstairs needs a good scrub. Spiral staircase is RIGHT THERE wherever you turn if you are in the living space and if you are over 5 feet you need to fully aware of you'll get clocked. Some of the dining room chairs are quite literally falling apart. Drawers in the large bedroom don't open unless you struggle. You have to go up 2 sets of stairs from the parking garage so bit of a struggle if 'older' or have kids or knee issues. HOWEVER - there was plenty of hot water, plenty of towels, good shampoo/conditioner/lotion/soap, dishwasher works, sofa was comfortable (but we did not open sofa bed in either up or down stairs to test), the upstairs jet tub was VERY welcome after a day of skiing, the condo was quiet, we were a 5 minute walk from Eagle Lodge, parking was covered, fireplace and wood was nice (but no matches, had to buy a lighter - which I left - you're welcome), Von's is just down the road, TV worked fine, WI-Fi worked well, plenty of outlets, heaters worked well. Hi L. G., Thank you for staying with us. We sincerely apologize for the inconveniences you encountered during your stay. We have notified our housekeeping staff of the shower and hope to provide a better experience in the future. Thank you! This property is walking distance to Eagle lifts and fulfilled our needs in this respect. In every other respect it disappoints. The furnishings are tired, the kitchen appears original to first build, there is no microwave and a hob kettle is quaint or annoying depending on how quickly you need a cup of coffee. There is now a flat screen TV but most other consumer electrics are outdated. A great place if you still have VHS! The pictures have either been enhanced or are from a time long long ago. While it is understood that advertising should promote the best view - this property listing over-promises and under-delivers. I would not use it again. We booked this condo for the 4 day New Years weekend. The location is very good. You can walk to Eagle Lodge very easily, but that is about the only benefit. The owners clearly don't care one bit about their tenants and the management company is completely useless. First, the television did not work. After wading through 6 remotes sitting on the TV with none working, I found the remote in the upstairs bedroom, this allowed me to change the channel, but the sound on the 30 year old TV was broken. I called the management company and they did nothing for 3 days, finally showed up with an equally old TV, but they could not make it work. So no TV. Second problem, no WIFI. 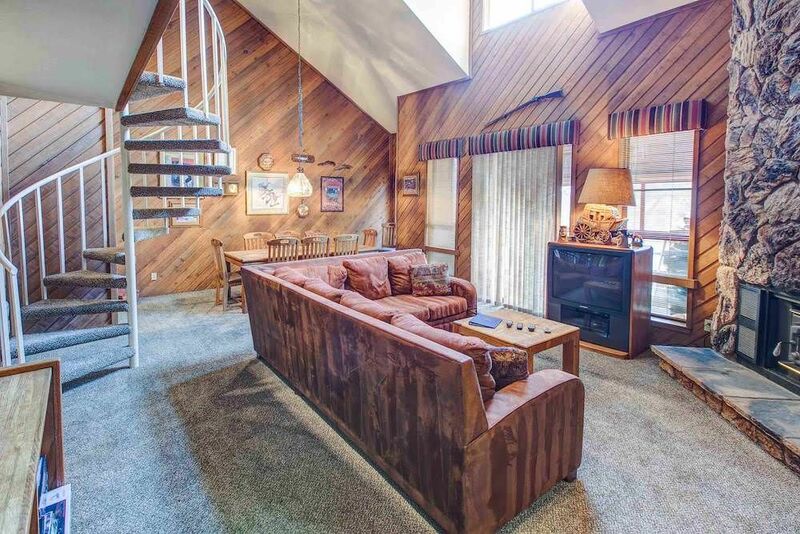 We choose this condo in part because they had WIFI, my oldest does not ski, so I wanted him to have internet and TV, with no TV , we turned to the internet. Again, no service, I called and explained to the management company that they lights on the router indicated that there was no signal coming in, not a case of spotty service, just no service at all. They did nothing. The third issue came when it was time to cook dinner. The oven and microwave, if you can call it a microwave, are easily 30 years old. The oven did not work, at all. I discovered this as I was preparing to cook dinner for my family of 5 and 5 guests. This time the management company sent someone out to look at it. They confirmed the oven was broken but did nothing about it. They promised to send someone the next day to fix it. That didn't help me one bit with my dinner problems, and no one ever showed up to fix it the next day. I should also mention that the place really was not very clean, every dish I pulled out I had to wash, I found food caked on pots and pans. The fact they came clean easily with a little washing showed the lack of effort by the cleaning people. The silverware was literally thrown in the drawer in a heap. The place had exactly one spatula, cooking utensils scattered around the different drawers, this alone is minor, but when added to the other issues, added insult to injury. They clearly don't care about the tenants. For less than $1000 they could easily address everyone of these issues. $199 buys a brand TV at Costco. $150 an real microwave and a new stove is less than $500. I don't think that is too much to ask of a place charging you $3000 for 4 nights. Do yourself a favor, book a different condo. I would give it zero stars if that was an option. I am so sorry to hear that your stay was less than pleasant. I will definitely talk to my general manager about these issues and get them resolved! Thank you for sharing and we look forward to hosting you again.